Some time ago, God planted a seed into the hearts of the congregation of Maple Grove United Methodist Church. That seed was the idea that what had once been a rural congregation to a farming community in generations past had the opportunity to become a new faith community in the midst of the suburban neighborhood that was beginning to spring up all around it. As that seed sprouted, it grew into new ideas to bring new ministries for new people in a new building that was bigger, more modern and multi-functional. This year, we saw those ideas produce its first harvest with the completion of the new building! Thanks be to God for the abundance of blessings that are now being realized through the dedication, work, and generosity of so many over the past few years! These are wonderful dreams for our church! And you can help us turn those dreams into realized ministry in the next year with your commitment to support this congregation of The United Methodist Church with your prayers, your presence, your gifts, your service and your witness. Sunday, November 25 will be Commitment Sunday at Maple Grove, when we will use part of our worship time to make a commitment about specific ways we will promise to support the church in 2019. The administrative council met last week to set our Ministry Goals for next year. We chose three primary areas in which to focus new ministries in 2019: Hospitality Ministries—focusing on welcoming, following up and connecting with our new attenders, plus mid-week meals and other fellowship opportunities; Children & Youth Ministries—focusing on seasonal events, Sunday School and mid-week programming; and Worship Ministries—adding seasonal choirs, new worship teams, and equipment to enhance our worship quality. In addition to the growth of these new ministry areas, this will be the first year that salary support from the Iowa Conference of the UMC for our full-time pastor will begin to decrease, as we make strides to increase our support, with the goal of independent support by 2022. In 2019, we will be making a larger step toward independence than originally anticipated, due to a large deficit in church-paid apportionments to the conference overall this year, thus resulting in less funds available for conference grants. The General Operating Budget put forth by the administrative council for 2019 is much larger than the 2018 budget, due in part to the increase in pastoral support, and to the fact that we have been operating as a “pay the bills” church for many years. We now have the opportunity to become a “God’s Vision” church, making a faith-based ministry plan in order to faithfully move in the direction of what we have been discerning as God’s vision for Maple Grove—the church we dream we can be! This Stewardship Campaign is the way that we are communicating our church’s ministry goals to you, and asking for you to pledge your support. Over the next week, we ask you to be in prayer about the ways that your joyful generosity will continue to produce a harvest where peoples’ needs are met; where families, children and teens can gather to make friends, to receive care, and to grow in faith; and where ‘many expressions of thanksgiving to God’ are multiplied! Your support of Maple Grove in 2019—with your prayers (for our church, our community & our world), your presence (in worship, in fellowship & small groups), your gifts (of time, talents & treasures), your service (by getting involved in the work & mission of the church) and your witness (by sharing your own story of the ways you have felt connected to God in and through Maple Grove)–will be vital to helping us become the church of God’s vision! Enclosed with this letter is an overview of the proposed 2019 General Operating Budget and an “Estimate of Giving” card, which is an essential tool to help our Administrative Board know whether we can move forward with the ministry goals and budget we have set. Based on your responses, we will vote in January to either move forward, or to make changes, which may include moving the pastor position to half-time. 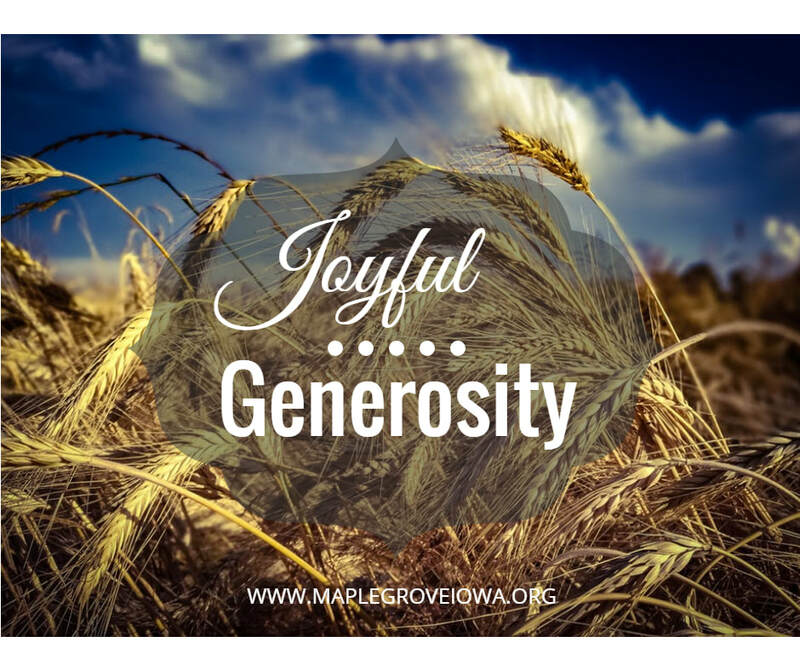 Please prayerfully consider the level of generosity that you feel God is leading you to. We invite you to commit to giving financially to this ministry budget, either as a first-time giver, or by increasing your giving as you are able. Cash or Check – Offering envelopes are available at the Welcome Desk. Your gifts can be placed in the weekly worship offering plate or they can be mailed to: Maple Grove UMC, P.O. Box 845, Waukee, IA 50263. Appreciated Investments – Stocks, bonds, physical property, Qualified Charitable Distributions, and other securities are a welcome gift. Some members have found the tax savings make this an ideal way to fulfill their commitment, as contributions are equal to the fair market value, while tax liability on capital gains is avoided. Direct IRA Minimum Distribution – Donors who are 70 ½ or older can give their gifts directly from their individual retirement accounts tax-free. By avoiding federal and state taxes on the amount, donors can increase their support to Maple Grove at no additional cost. ​Update on the “Hope” Capitol Campaign (New Building Fund): We have paid $270,268 in cash, and currently have a balance of $200,000 in our “Hope” fund, with an additional $27,267 pledged over the next two years. The total amount we will be financing is $570,000 which will result in monthly payments of $3,600. These payments will be made from the Capitol Campaign fund, and not from our General Operating Fund. If you are still paying your pledges for the building fund, or would like to make a first-time or increased pledge to the building fund in 2019, please complete the bottom portion of the “Estimate of Giving” card. Maple Grove has a lot of talent to offer to God and our neighbors in being able to design and lead inspirational and authentic worship. New ministries in worship will include seasonal choirs, new worship teams, new sheet music, and new audio/visual aids and equipment, some of which require annual licensing fees. As early as December 2018, we have plans to offer more seasonal opportunities for children and youth, and their families, to connect with Maple Grove, such as an Advent Festival that includes Breakfast with Santa, Youth Movie Nights, Family Movies under the Stars, a new Sunday School Curriculum, Youth Coffee Talks (Bible Studies), and Summer VBS. We believe these are vital ministries to our neighborhood families! We believe that having a quality welcoming ministry is vital to becoming the welcoming church where our neighbors feel that they belong! This ministry will include three annual marketing campaigns to the community, as well as connection tools such as connect cards and brochures, quarterly Pie with the Pastor opportunities, and other printed materials as needed to invite, welcome and connect with newcomers. Apportionments are the fundamental method the church uses to fund mission and ministry beyond the local community. United Methodists, from its beginning, has been a denomination that believes congregations are to fund both a local ministry and a ministry beyond its own community to the world parish. For the followers of John Wesley, ministry has never been one or the other but always both. The Iowa Conference of the UMC has been working diligently to decrease its overall budget by more than one million dollars by 2020, in order to be better stewards of these funds. Beginning in September 2018, we opened the new Worship & Community Life building, and will now be paying utilities, security monitoring, internet and insurance on the new building, in addition to the utilities and insurance on the historic chapel. We are excited to see the many new ways that our faith community and the broader community will use this new space to build relationships with God and with each other! We believe that becoming the church we dream of being depends upon having the leadership of a full-time pastor. The full-time cash salary for a second year licensed local pastor is $42,568. Supporting a full-time pastor also includes providing health insurance ($16,716), pension ($8,990), a parsonage or housing allowance ($17,367), continuing education expenses (up to $1,000), travel expenses (up to $3,000) and additional reimbursed professional expenses (up to $650). After the conference grant award of $38,000 in 2019, Maple Grove’s portion will be $52,291.